Our Filipino Community (FAC), within the larger Parish Community, is made up of people who speak the many Filipino languages. Inspired by the pastor (Fr. Mirek), who vigorously sought and encouraged the active participation of the various ethnic groups within the parish, started the Filipino Mass in November of 2013. 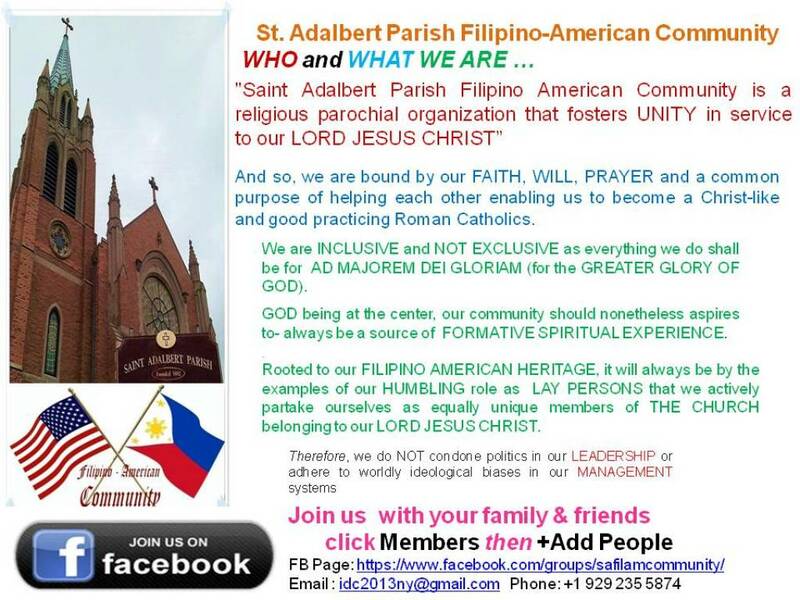 Filipino-American Community (FAC) responded with great enthusiasm and began a dynamic involvement in ever increasing and varied activities in the parish. The members of the FAC actively participate in parish life serving as Lectors, Eucharistic Ministers, Ushers, Choir members, Parish Pastoral Council members, and CCD teachers. All this is in recognition of the overwhelming presence of Filipinos in the parish and as a way of reaching out to them with help to practice our faith in their own culture. Filipinos gather together on the 4th Sunday of each month for the Eucharist and to support each other. FAC celebrates its heritage and traditions organizing social activities, events, galas, family and youth gatherings. These celebrations increase their enthusiasm and give opportunity to share many talents in liturgy, music, and dance. How to get involved? You can participate by helping with our monthly service opportunities. You do not need any special skill or training to be involved. Just come and worship with us. If you are not a parishioner you may sign up, if non-member, we have service opportunities for you too!